There are two world amateur Baduk tournaments in the world. First is World Amateur Baduk tournament and the other is KPMC. First one is opened in Japan and KPMC is opened in Korea. World Amateur Baduk tournament has been held in Japan for 34 times so far, and KPMC has been held in Korea for 8 times. The difference between two is the number of games in a day. 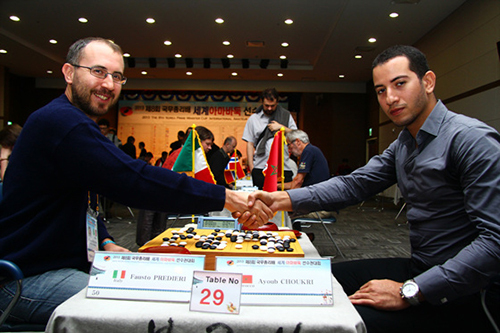 It is because KPMC has its aim at spreading Baduk in the world and also the Korea culture to all participants. So KPMC has tighter schedule but have more chances to get experience in a variety areas. 8th KPMC has had its opening ceremony on 11th, and the tournament was held on 12th directly. In Total, 61 players from 61 countries in the world have attended this year. It has 3 games a day for 2 days and choose the winner with Macmahen system. Korea has won this tournament for 5 times from 2006 and Han SeongJu won this tournament last year who is already pro now. This year, Park JaeKyen 6Dan is a representative from Korea by having a selection tournament. Park JaeKyen 6Dan won 3 games in first day. He is known to be very strong in reading and use well of influence in the middle game. Other strong player is Li Pu 8Dan from China and Kikou Emura 7Dan from Japan. Both players won 3 games in the first day together with Park JaeKyen 6Dan from Korea. Three players are expected to compete for the winner this year.